Enterprise Architect is a rich modeling platform that can be used in a wide range of modeling and design situations, from a single user accessing a file based repository to a large and distributed team of thousands of modelers working all over the world using a Cloud Based Repository. The repositories can be scaled up and down, and a project that started with a single user can be seamlessly scaled up to a large multi-user repository. Enterprise Architect has been built to support inter-disciplinary modelers collaborating to create a single and unified view of a system or enterprise, and the platform has numerous built in features to support this team development. By taking advantage of the base UML modeling language, in addition to the numerous extension languages such as BPMN and SysML, plus highly effective frameworks such as TOGAF and UPDM, modelers, designers, managers and others can build comprehensive, inter-connected models that fully expresses the capabilities, structure and behavior of fully functioning, multi-layered, complex systems and/or enterprises. In addition, there are features that allow modelers to discuss the model, such as the element discussion window, and review work that has been in progress in the Team Review window. Modelers can even send Model Mail to communicate ideas. Model Security can be implemented, which facilitates collaboration and prevents work accidentally being overridden. There are a range of project management features, such as tasks and resource allocation and a Gantt Chart to view progress on tasks over time, and a Project Calendar that keeps track of important project events. Integration is so easy and the feature sets so powerful that strategic thinkers, business managers, architects, information and data modelers, testers, software engineers and many others will derive great benefit from using the tool and incorporating their models into the overall vision. This collection of images illustrates some of the Model Repository tools available to you in Enterprise Architect. Enterprise Architect models are stored in standard relational databases. This approach has been built into Enterprise Architect from the very first version. Using a relational database provides a huge advantage over other tools that are limited in scope and capability by relying on a simple text file based model storage system. With support for two file based repository formats (MS JET and Firebird) plus a number of industry standard DBMS servers (such as SQL Server, MySQL and Oracle) plus Cloud based storage, Enterprise Architect provides fast, scalable, flexible and transparent access to models in a wide range of deployment scenarios. 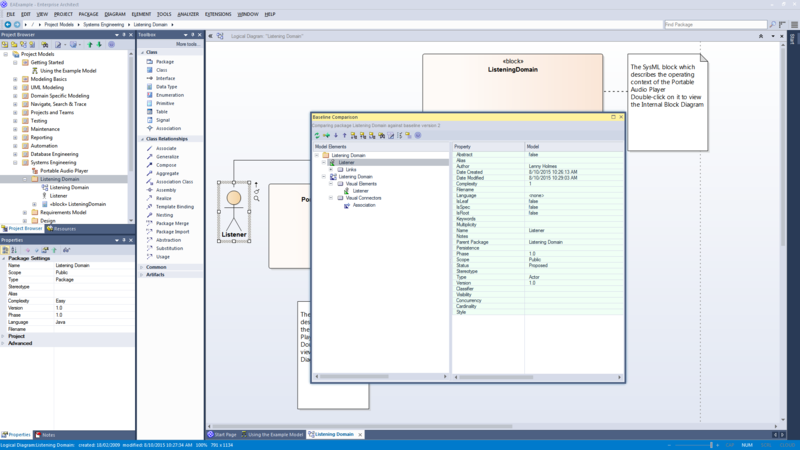 Enterprise Architect is based on industry standard UML, a specification maintained by the Object Management Group (OMG). Although initially conceived as a modeling language primarily for software development, over the years the capabilities and formal (standard) extensions have allowed the UML to develop into a rich set of constructs and modeling behaviors that provide very rich and detailed support for everything from software, to business processes, embedded software, enterprise architecture, organizational charts, strategic model, mind mapping, requirements management and much more. The success of UML has been proven over and over again in the real world and the number of new technologies and modeling profiles that use UML as the underlying 'meta-language' are tribute to the power and effectiveness of UML. From the very first version of Enterprise Architect the goal has been to provide the best and most accessible support for Team based development. A wealth of tools and capabilities have been designed into the platform over the years to support security, scalability, information sharing, concurrent access, management, reporting and querying. With the growth of the internet and distributed development scenarios, Enterprise Architect has evolved to be the pre-eminent platform for developing models and designs in a globally distributed situation. The Cloud Server based deployment offers high availability, excellent performance and simple configuration to rapidly bring diverse and distributed teams into a single, living repository where work can be easily shared, reviewed, discussed and managed. By leveraging the power of today's DBMS servers and Cloud Based technologies, Enterprise Architect can be easily scaled up to truly epic proportions. Millions of objects can be stored and accessed by large and dispersed teams in real time. The level of scalability is limited solely by the choice of DBMS or Cloud Technology and the capabilities of the network and server infrastructure the model is deployed on. In practice, over the many years that Enterprise Architect has been used in industry, modelers and designers have taken advantage of the powerful in-built scalability to construct stunning and often huge models that capture an enormous amount of information about complex and highly inter-connected systems and enterprises. Due to the nature of the Repository used by Enterprise Architect and the possible deployment scenarios, security can be managed in a number of ways. In the Corporate edition of Enterprise Architect and above, there is built-in support for defining users and groups that permit locking and management of elements and Packages within the model. This will be discussed later in the section on Security. In addition, it is also possible to restrict general access to models by using file based security access for the MS JET and Firebird based models (.EAP and FDB) and DBMS server authentication and access for the larger database server based systems. As a further refinement it is also possible to restrict access to a model using the HTTPS protocol when connecting to a Cloud Based server. Enterprise Architect uses industry standard XMI (XML Interchange) format files to store and version model Packages. By integrating the import and export of XMI model fragments into a version control system (such as SVN) supported by Enterprise Architect, you can maintain multiple versions of the same model in different repositories and exercise fine control over the development and design process. Given the nature of this versioning system, there are several different scenarios that can be used to maintain different models and how teams access information. For example, where the versioning system is used as the single point of truth and de-facto Repository, it could be convenient to use many workgroup or single user based Repositories that reflect the actual model at a particular point in time. In contrast, where the versioned files are mainly held for backup and baseline purposes only, a larger, Team based DBMS server would be used to provide the model sharing and collaboration capabilities. So whatever the actual needs are, Enterprise Architect has a number of solution scenarios that can be adapted to provide the right level of change management and collaborative development.